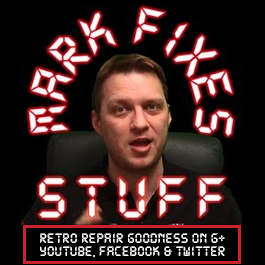 You can contact Mark Fixes Stuff in the following ways…..
Just looking to comp mod my 48k. Is it worth adding the capacitor? I do have some spare, does it make the best picture possible with it? Depends on your speccy. Mileage varies depending on the condition of the caps in the unit etc (they can affect image quality massively). It’s try it and see really. Best course of action for a refresh it to replace all the old capacitors – then you’ll get a lovely clear composite picture! Ok so replace the caps on the board then I shouldn’t need to add the new one to the rf / composite socket?